One of the charming parts about my house (reminder: 1880's Stick Victorian style) was that the front door was a French door. It was all glass and really fit the style of the house. However, there were a few big problems with it. First and foremost, the total width of the door opening was only 36 inches--regular door width. This means that in regular usage (with one side kept stationary) when the door was opened there was only half the amount of space to go through than is normal. The stationary side could be opened, but it was difficult to do with bags of groceries in your hands, so we were often left to shimmy through sideways. The second problem was that it was an old door with non-tempered, non-insulated glass, and there were gaps along all the edges. In winter, it was like a wind tunnel of cold air. We resorted to hanging a big heavy curtain inside the door, much like restaurants do, to keep the cold out. With heating oil prices sky high at the beginning of the winter, I finally decided to get a more traditional single panel door. 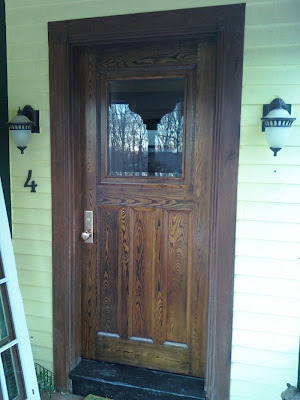 But not wanting either a cheap-looking steel or fiberglass door, or to shell out $1600+ (at least) for a custom solid wood door, I decided to buy a salvaged door and restore it. I drove down to the closest large architectural salvage business and picked out a nice solid wood door with a single (empty) cutout for glass that was in very good shape -- minimal marring of the wood, and it was just the right size. I only needed to strip and refinish it, and get a new piece of glass and new hardware. The door itself was $200. 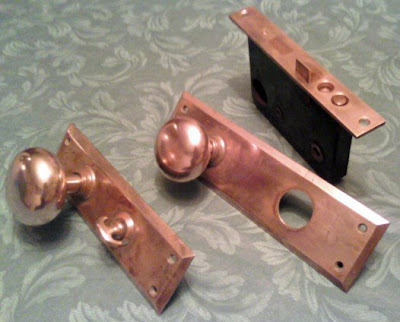 I also bought an antique brass lockset for $20 that was just the right size and only needed cleaning and refinishing. 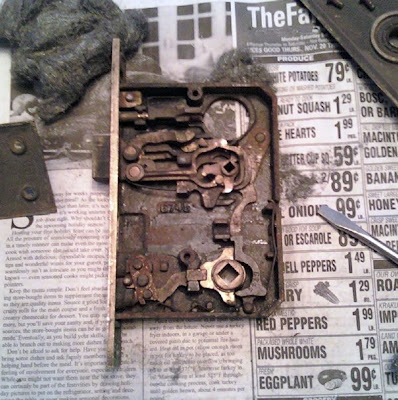 Here is a photo of the lockset, after I was about halfway done with the polishing: Note that this is an old style mortise lock, where the piece in the top right of the photo is inserted into the edge of the door. Also note that all of the pieces, including the faceplates, are solid brass, very heavy, with a wonderful feel to them. It's difficult to determine the age of this particular lock, but my guess is that it's roughly 100 years old, give or take a couple decades. The interior working parts are solid cast brass, and all they needed was some cleaning. It's remarkable how well this mechanism still works. The above photo is the interior of the lock. I took the picture before I dug in so that I could put it all back together if one of the springs popped the pieces all over. The catch is missing in the picture because I had already removed it to clean it. Another amazing thing about this mechanism is that newly manufactured versions look almost exactly the same. The technology has needed minimal updates in well over 100 years. Also during this time, I ordered a new piece of glass for the door. It turns out that they can put a nice beveled edge on tempered glass, which is great because it really adds a touch of elegance to the glass, and fits with the vintage nature of the house, the door, and the hardware. That was $95. Add in another $75 for solid brass hinges that match the hinges in the rest of the house (and including all the incidentals and supplies I didn't mention above) and the total cost for this project came in under $500. I installed it this past weekend and it actually fit! I had measured and measured and was pretty sure it would, but you never know. Not a great photo, but you should be able to make out how well the polishing of the brass knob worked, as well as the faint outline of the beveled glass. The thing to the left is one of the panels of the old French door. 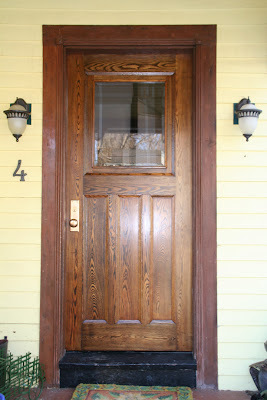 Once the weather is consistently warmer, I'll strip and refinish the trim to match the color of the door. The foyer is no longer a wind tunnel, which is one immediate benefit of the project. I can now walk in the front door without turning sideways, and my dogs can't see out the door and bark at every person or squirrel that happens by. And when I pull the door shut, there is a solid, deep, resonating sound of pleasant finality -- ka-THUNK! Thanks Jenn! This project felt like it took forever, but I think it was really only two months or so of working on weekends (and not every weekend). The most stressful part was deciding how to actually stain and seal it. I did hours and hours of reading and research. But now that I know how to do it, I won't be so apprehensive on the next project, which will probably be to install the custom-turned newel post I had made last year for my staircase. Great work. I love how you have prepared and carefully estimated the expense needed for the project. Renovating our own house is a good way to make sure everything is in order and go in the way we want. I’m impressed by your carefulness in taking each step in the process and the result is rewarding. Thanks for sharing with us and I’m pretty sure every timepassing by that door,a big smile will accompany you home.